One: Rejoicing God, we come together in your presence. All: Fill us. Make us overflow with the joy of your presence. All: yet so often we see only what we do not have. All: yet so often we insist that faith must be cut and dried, strait-laced, and serious. All: yet so often we prefer our own way to yours. One: Forgive our faltering faith, O God. All: Soften our hard hearts, unclench our grasping hands, and open our darkened eyes, that we may follow you into kingdom life. We pray in the name of Jesus the Christ, who makes all things new. Amen. So often we rely on our own understanding, our own faithfulness, our own desire. But if we believe that to be enough, we deceive only ourselves. Before God, and with the people of God, let us confess our need for forgiveness and guidance. Let us pray. Even in the midst of our imperfection, God can be seen, and in the midst of our repentance, God’s new life takes root. Friends, believe and live the good news: In Jesus Christ, we are forgiven. Thanks be to God! Amen. All: young and old, men and women, newcomer and charter member. All: introverts and extroverts, leaders and followers. All: faithful and doubting, hopeful and despairing, wise and foolish. All: singer and speaker and hearer, healer and in need of healing. All: and we are filled with gifts to be God’s people! How did things go yesterday? Did you do a ritual of reaffirmation of baptism? If so, how wet did people get? Did you use a particularly excellent (or terrible) prayer? Did a hymn work spectacularly or fall flat? Now that we’ve let go a bit of last week, time to look toward this weekend. It’s a bit of an odd one, as it’s simultaneously the season of the Epiphany, MLK weekend (which means a long weekend for many families…and here that means they all run off to warmer climes for a few days respite), and the inauguration. We are also nearing Annual Meeting season for many congregations. I wonder if we could fit in anything else? If you’re following the RCL, this week has a couple of beauties and a couple of texts that you wonder why they’re put together. 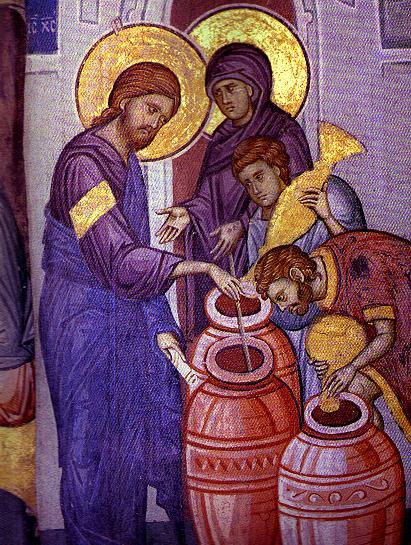 There is of course the Wedding at Cana, often included in the season of epiphany, because it’s one of the times (in John, the first time) we see that Jesus is rather extraordinary. Also extraordinary are the other characters in the story–we see Mary as the pushy Jewish mother, insisting on directing the life of her grown son. We see the people who, for some reason, fill up 150 gallons of water without batting an eyelash or making any snide remarks. We see a steward and bridegroom who appear to believe that no, really, there WAS more wine in the cellar…and through it all, no one appears to need to actually take a ritual bath. Good thing! Though you have to wonder…is there wine in there? Or is there wine only when someone who needs it turns the tap? Is the miracle in the obedience? The moment of need? Or somewhere in between? There’s also the spiritual gifts of 1 Corinthians 12 to work with this week–a perfect set up if you’re leaning into annual meeting season (especially since the following week, when many many meetings will be taking place to meet those bylaws that it has to be “no later than the first sunday in february” and to avoid a conflict with Super Bowl parties, the text is the second half of the chapter on the Body of Christ). It is one of my favorite things to point out to people that faith is a gift given to whom the Spirit chooses. How do you see the gifts of the Spirit at work in your community? How do people with varying gifts work together for the common good? How might this be a text we can apply to our nation in the midst of the inaugural festivities? This text is just BEGGING to be turned into liturgy–someone write a confession or an affirmation faith, stat! Isaiah again gives us soaring rhetoric–language more exalted than anything we’ll hear elsewhere. There’s something a little edgy in the subtext of this classic comfort text, though. I can’t quite put my finger on it. There is something here that could be used if you’re celebrating MLK weekend, if you can put your finger on just what that subtext might be. And for those congregations grieving or feeling as if they’re wandering in the wilderness, this is good news indeed. Anyone out there serving a church as a long-term interim? There is good news for impatient wondering people in here. And the psalm…I must admit that my Presbyterian heart is tempted to simply read the psalm responsively as a confession and assurance of grace all in one fell swoop this week. It’s incredible how easily the psalmist seems to flow from repentance to hope to praise and petition. There is always a part of me that wants to stick with just one for a bit before getting on with it…perhaps there’s something for us all to learn in how they interweave in this psalm. Are you off lectionary for a series or holiday? Are you following the narrative lectionary? Stop by in the comments and share your idea-seeds–you never know when a little comment-conversation might spark growth of creativity for all of us!